Peter Mac is the home of Australia’s largest cancer research group. And because they’re embedded within a hospital, our researchers ride in the lifts with patients and their worried loved ones. This is an incredible driver. Our researchers are passionate and determined to find new and better treatments, as quickly as possible, so that every person with cancer has the best chance of cure. Our research program encompasses 31 laboratories and approximately 600 laboratory scientists, clinician-researchers, research nurses and other health professionals. They are involved in basic, pre-clinical and translational research, clinical trials and research to improve the social, emotional and physical impacts of cancer on patients, their families and carers. 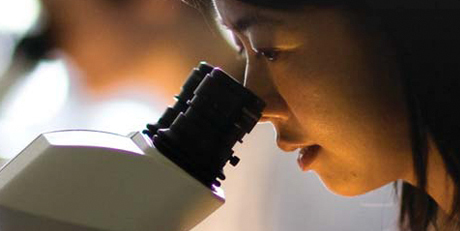 Because Peter Mac’s laboratory researchers are embedded within the hospital environment, they are uniquely placed to translate research discoveries as quickly as possible into real treatments for cancer patients. Our cancer researchers are internationally recognised for their leading role in accelerating the search for cancer cures. However, they rely on donations from the public to make their vital work possible. Find out more about why our researchers need your help.